To demonstrate how long the project has been in the works, it won zoning approval in 2007. Developer Rick Barrett reported that he had a difficult time finding financing, stating that he had talked to hundreds of banks. It’s no secret why that might have been, with hundreds of units available on the condo market in Milwaukee (largely collected in a few buildings) and commercial real estate lending virtually non-existent as the economy falters. Arguments have been put forth by aldermen that the Council should look at providing more aggressive financing for projects to ensure that the Milwaukee tax base continues to grow with no gap after the recession ends and that more jobs are maintained in the meantime. The proposal to finance The Moderne seems to be a manifestation of that thought, with the knowledge that even if construction were to start today it wouldn’t end until 2011, when hopefully the recession is a fading memory. 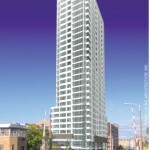 The project will easily be one of the most dense buildings in Westown, with its good urban design and small footprint. 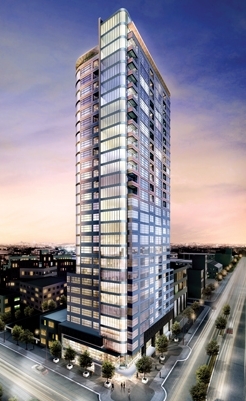 As a comparison, The Palomar, which was proposed just across the street, was to occupy an entire city block. 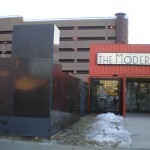 The Moderne will occupy a small plot of land next to Vecchio Bar and Grille. Hopefully it can serve as a catalytic project to spur more quality urban development in the Park East and Westown. Awesome! I have been waiting for some good news about this project. 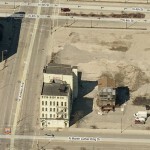 I think I am not alone in saying out of all the stalled projects in the city this is the one that needs to rise. 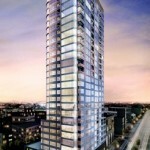 Its funny how the city turned down a similar request for the Palomar project. Won’t they need to get additional financing for contruction from somewhere else as well? @Mike The Palomar had a few similarities, sure, but this project is quite a bit different. A few quick points, and I’m sure the upcoming meeting will flesh out more. 2. 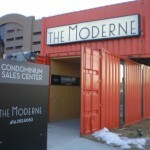 The Moderne is overwhelming apartments. It’s easier to support bringing more residents downtown, especially ones that aren’t buying. 3. Equity in each project, not sure what the differences are/were exactly, but the Palomar still wanted almost twice as much money. 4. Quality of the project. The Moderne looks good and fills the lot in a very pedestrian friendly way that will be good for the buildings around it. The Palomar featured a large parking garage. 5. Local investor versus out-of-state investor. Just curious, is developer Rick Barrett of any relation to Mayor Tom Barrett? That would be the story of the year if that were true, but I’ve never heard nor seen any indication that he is. Over the past weekend at the GMAR downtown condo tour, the realtor selling the condo units in this building told me they were breaking ground November 16th. I told her I had been following the project and what a great addition to downtown this building would be, then I indicated my skepticism – that’s when she told me about the ground breaking. I have also heard of earlier ground breakings of this building, that have gone and past, let’s hope this one is a go. Great news. The renderings for this building are fantastic. Love it. Beautiful and medern looking building. No wonder why its called Mederne. We need more of those in the city and especially downtown area. It looks like it’s going to be a beautiful building. I really hope it is the catalyst people think it will be, because that neighborhood needs a lot of work. I doubt it will be, but I still hope it is. I’m just not sure “luxury” can be sold in that part of town, yet. I think the park east neighborhood needs a stronger foundation in safety, cleanliness, beauty and amenities before people will want to live there. Saying, “Build it, and they will come,” doesn’t sit right with me in this situation.